Transport minister Nusrat Ghani has announced £48m Government cash to nearly double the UK’s fleet of ultra low emission buses. 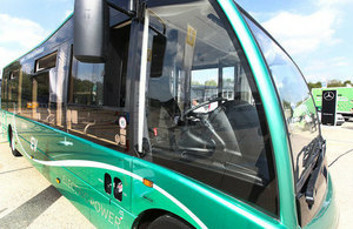 Officials said the cash from the Office for Low Emission Vehicles would pay for 263 new buses, taking the total to 540. Speaking at the UK Bus Summit, the minister also announced a new partnership with charity Greener Journeys ‘to reflect the pivotal role played by the bus industry in tackling loneliness and social isolation’. The Department for Transport said the partnership will see companies across the sector pledge to do all they can to tackle loneliness, including through innovative vehicle design and initiatives to encourage bus passengers to talk to each other. Ms Ghani said: ‘Buses are far more than a way of getting from A to B. They are a crucial tool in the fight against loneliness and it is good to see the industry taking steps to tackle isolation. Officials cited schemes launched by the bus sector, including Go Ahead Group’s ‘Chatty Bus’ campaign, which encourage conversations between passengers, and ‘Hattie,’ a community bus from Stagecoach specifically designed to provide a friendly environment where people can chat to others. Greener Journeys chief executive Claire Haigh said: ‘Research from Greener Journeys shows that a third of people in Britain go at least a day a week without speaking to anyone - not a friend, colleague or family member.